Our only choice may be between a corrupt, mendacious war criminal and a seemingly unhinged egomaniac. We will have no other options. We are prisoners to the divide-and-conquer duopoly. Not voting, or voting for a sane candidate from a third party is insane. Voting for power-mad psychopaths is perfectly rational. Why throw your vote away on a “loser” when you can use it to help elect a despot? 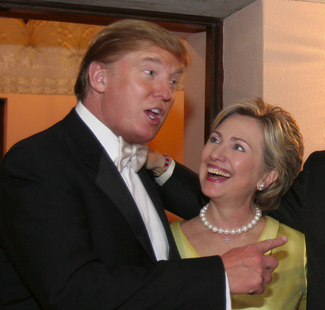 One candidate helped lie us into the Iraq War and build the police state, and the other sprang from her legacy of chaos and failure like a mutated creature spawned in a fallout zone. This is the suicidal, national consensus born of mass narcissism, mutual paranoia and communal hypocrisy posing as pragmatism.